The Madison Vinyl Arch Arbor is masterfully crafted by Amish and Mennonite craftsmen in Lancaster County, Pennsylvania. It is built with integrity and the highest commitment to quality. 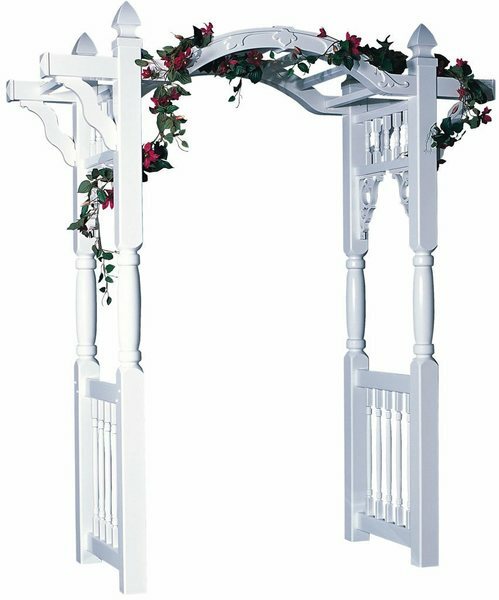 You will love the details on this beautiful Madison style arbor with its arched top and beautiful curves. This 7 ft. arbor is made of durable vinyl material so it won't rot or ever need to be painted. Order online using our safe and secure check out, call to speak to a friendly sales associate over the phone or stop by our store in Sarasota, Florida. Held into place with aluminum ground anchors, which are included with the arbor.